Description EPN devices include all computers, tablets, and smartphones used to access applications and databases residing on the LAN, cloud computing servers, social networks, and Internet web servers. EPN devices also include specialty devices with embedded web servers such as VoIP devices, surveillance camera, DVRs, media servers, and network printers. 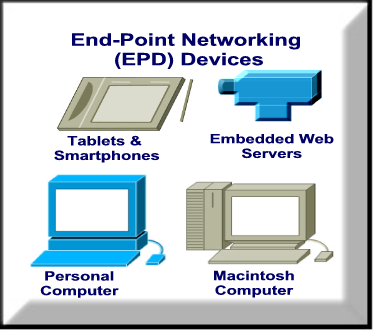 H/W Components EPN hardware include Personal Computers, Macintosh Computers, iPads, tablets, iPhones, and Smartphones. Network Protocols Internet Protocol (IP) including HTTP, FTP, SMTP, IPv4/IPv6, and ICMP. TIMC Monitoring ISP, CSPs, social network providers, and web/Email servers are monitored continuously 24/7 using E2ERA, SysLog, and SMTP. TIMC Remote or Local) Management DSL/cable modems, ISPs and TIMC Web Clients. Performance Reports EPN activity summary reports are created weekly, quarterly, annually, and on-demand. In todays web-based and cloud-based networking environment, the primary role of end-point networking devices such as PCs and MACs is to provide a standard, architected user-interface for accessing business web-based applications and databases such as Internet websites, Intranet websites, social networks, cloud computing applications, and legacy applications. In this simplistic "back-to-the-future" approach to end-user computing, end-point devices are analogous to the smart clients in the old Client-Server computing paradigm, or the dumb terminals in the even older mainframe computing paradigm. As this implies, the vast majority of the processing performed in today's end-point devices is done by the web access components such as Internet Explorer or Firefox web browsers that support web-based protocols such as http, https, ftp, ftps, and other web protocols. It does not matter what type software or operating system is running on the end-point device, as long as it, 1.) has an Ethernet or 802.11x Wi-Fi adapter, 2.) supports the IPv4/IPv6 protocols, and 3.) has a standard web browser with which to access the business applications and databases on the servers attached to the technology infrastructure. Today's PCs, MACs, tablets, and even smartphones are hundreds (and in some instances, thousands) of times more powerful than their 1980s terminal predecessors, and this enables these end-point devices to connect to IP-based LAN at megabit or gigabit speeds rather than the 1200-to-2400 bits per second of these earlier terminal devices. Additionally, these new end-point devices has the required processing power to parse the raw information sent across the technology infrastructure, and display it in an intelligent form that is usable by the end users of these devices.